Unless you’re a thirsty plant, getting caught in a rainstorm is almost never a good thing. 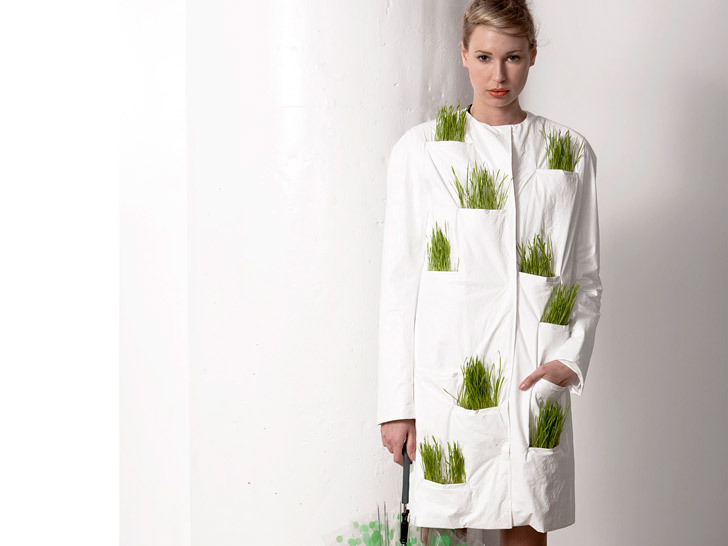 But what if you could stay dry, help something grow, and make a distinctive statement all at the same time? Wrk-shp’s “living” raincoat does just that. Inspired by sustainable architecture, specifically “breathable” walls, designer Airi Isoda playfully translated green-building principles into something wearable. “I thought, why not water plants with rainwater if you’re going to be out in the rain getting wet?” she tells Ecouterre. Using materials commonly found in buildings, Isoda created a coat made of Tyvek, a recyclable high-density fiber that allows water vapor, but not liquid water, to pass through. 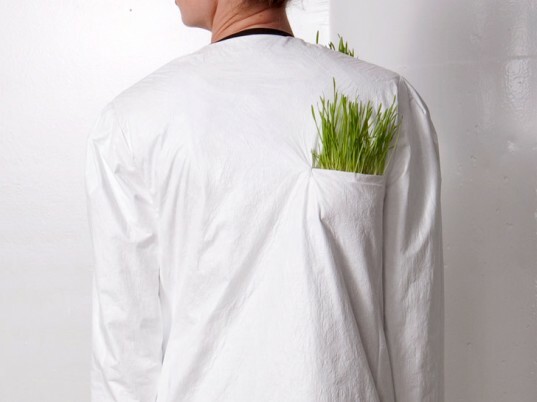 With strategically placed, origami-folded pockets planted with real wheatgrass, the Tyvek coat “grows” with every rainy trek you take. While seemingly rugged, this jacket maintains an air of luxury with a 100 percent silk lining and a flattering cut that melds effortlessly with your favorite looks. The recyclable Tyvek material allows water vapor, but not liquid water, to pass through. That Isoda has a degree in architecture should surprise no one. In fact, her observations of the urban landscape, where both fashion and buildings coexist, are her primary source of inspiration. The Tyvek coat is just one design from Wrk-shp’s Fall/Winter 2011 Collection worth checking out. Here’s one raincoat that may actually have us singing—and growing—in the rain!